Atos, a global leader in digital transformation, today announces an agreement with the Science and Technology Facilities Council’s (STFC) Hartree Centre that will see one of the UK’s leading high-performance computing research facility take the first UK delivery of an Atos Quantum Learning Machine, the highest performing quantum simulator in the world. 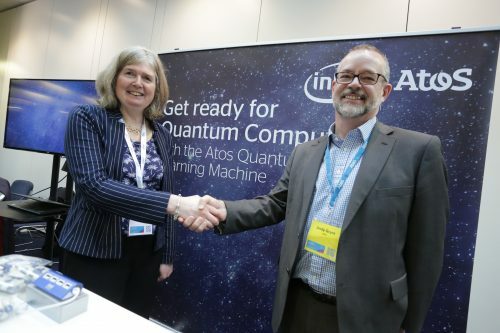 This Quantum Learning Machine will be one of the highest-performing ever deployed by Atos and will be used to develop new quantum-based services designed to help researchers and industry prepare for the coming quantum computing revolution. These include quantum algorithm development and the first UK repository for quantum algorithms, collaborative research projects on quantum computing applications and specialist training. This new collaboration builds on an established partnership between Atos and the Hartree Centre, which began with the UK’s first Bull Sequana X1000 supercomputer being hosted at the facility in 2017. The Hartree Centre, based at Daresbury Laboratory and part of the Sci-Tech Daresbury Campus in Cheshire, UK, also hosts the JADE national deep learning service. In November 2016, Atos launched an ambitious program to anticipate the future of quantum computing and to be prepared for the opportunities as well as the risks that come with it. As a result of this initiative, Atos was the first to successfully model quantum noise. To date, the company has installed Quantum Learning Machines in numerous countries including Austria, Denmark, France, Germany, the Netherlands, and the United States empowering major research programs in various sectors. For more information, visit atos.net.